Looking for a soccer class for your toddler? 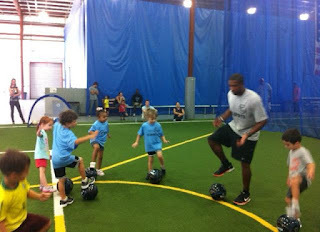 Future captains Sports Development Soccer Clinic is starting classes for kids ages 18 months- 6 years old. We developed the FC Sports Curriculum using various child development theories as its foundation. We made sure classes are age-appropriate in terms of physical, cognitive, and emotional abilities. We created each game to incorporate child development so that coaches and parents can understand why we do what we do. *Cognitive: They will assist the participants with improving attention span and ability to concentrate. *Physical: The participants will work on running, kicking, and jumping. They will focus on foot-eye coordination and balance.